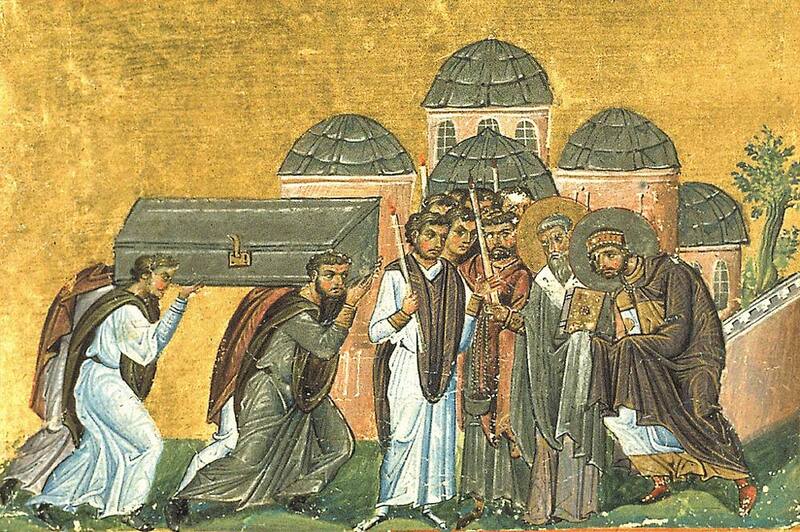 The Church of the Holy Apostles was an early Christian church in Constantinople. Also referred to as the imperial cemetery, it was originally built in the fourth century AD. Over the centuries, Byzantine emperors repeatedly improved and expanded the church. Second only in size among Constantinople’s churches to the Hagia Sophia, the church was demolished by the Ottomans after their conquest of the city, in order to make space for a mosque. Few traces of the Christian building now remain. The emperor Constantine, who founded Constantinople and named it after himself, dedicated the original church in around 330 AD. When he died seven years later, the building was still unfinished. It was completed by Constantius II, his son, and Constantine himself was buried inside. The original intention of the emperor was to place relics of the Apostles in the church, in tribute to its dedication. However, relics of only three saints – Timothy, Luke, and Andrew – were actually obtained, leading to a widespread belief that the church was dedicated only to them. In the sixth century, the emperor Justinian decided that the church was not sufficiently impressive, and so it was pulled down and a replacement was erected. Contemporary historians differ on whether the impetus for the new building came from Justinian himself or his wife Theodora. The new church, which had been designed by the renowned architects Isidorus and Anthemius, was consecrated in June of 550, with the saints’ relics and those of Justinian being placed inside. The former emperor and his family now also gained a mausoleum at the northern end of the building. At some point in the ninth century, Basil I conducted a major renovation of the church. About a hundred years later, Constantine of Rhodes dedicated a verse about the church’s construction to the emperor of the time, Constantine VII. The church suffered considerable looting in 1204 because of the Fourth Crusade. The crusaders were said by medieval historians to have stolen huge quantities of gems and precious metals from the tombs of the emperors, including the golden crown of Heraclius. Some of the treasures ended up in St. Mark’s Basilica in Venice, where they remain to this day. For seven centuries, the Church of the Holy Apostles was second only to the Hagia Sophia in importance among Constantinople’s churches. The Church of the Holy Apostles was in a very busy part of the city, along the central street which formed the main thoroughfare of the newer, expanded Constantinople. This gave it a close link with the everyday life of the city, and influenced the fact that large numbers of prominent citizens, including the majority of Byzantine emperors, were buried there. In many cases, the relics of bishops and patriarchs remained objects of veneration for hundreds of years. Although by the later Byzantine era, the church contained a very large number of venerated relics, some were considered more significant than others. In particular, the skulls of the three saints – Timothy, Luke, and Andrew – were immensely treasured. At least one other major saint, John Chrysostom, had relics preserved in the church, as did a number of lesser saints and martyrs. Another important possession was the so-called Column of Flagellation, which was reputed to have been the place where Jesus was flogged before his crucifixion. The church also received many gifts of gold and jewelry.